I drive a 5-speed Honda Civic EX which I bought new in 2006. 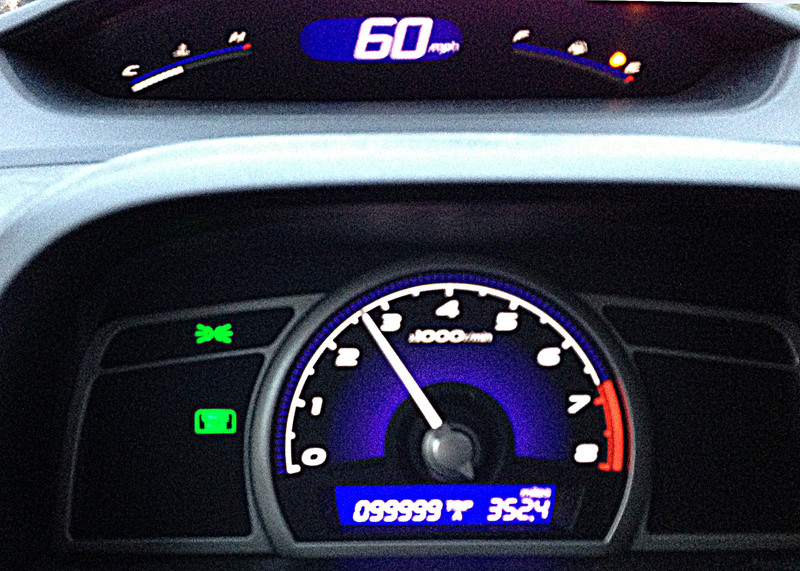 Not too long ago I looked down at the dashboard and saw the big 100k miles approaching. Somehow the following picture managed to show up in my cell phone, obviously taken by a professional driver on a closed off road. And not by a simple-minded commuter who happened to be in the middle of heavy freeway city traffic and going the indicated 60 mph at the time. The odometer shows 99,999 miles, so I missed the 100,000 mile milestone by one, but there was only so much driving-by-knee in heavy traffic that I could do that day. But this post is not about odometer / speedometer pictures. It’s about something even more fascinating: gas mileage. (“Wow!”) I’ve been methodically collecting mileages and gas numbers at each fill-up over the last 7 years. (“Why? ?”) I managed to gather up all the numbers over that time, calculating and compiling mileage numbers tankful by tankful. Here’s a graph of the car mileage over that time. Click/tap on the picture for a larger (more fun!) version. 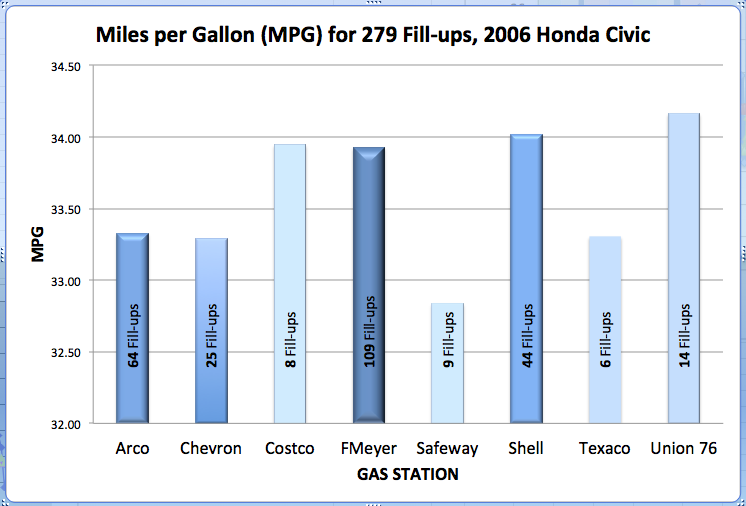 Miles per gallon (MPG) for each of 298 tankfuls over 7 years. Vertical color bands are by season of the year. The blue spiky line (with diamonds) is the mileage for each tank, varying between 28 and 40 mpg. The orange line is the average mileage over time (total miles divided by total gallons). It slowly increased and settled to about 33.7 mpg. The wavy green line is the average mileage over the last 10 tankfuls at each fill-up. That is, it represents the mileage of the most recent tank at a given fill-up date, and the 9 fill-ups before that. One interesting part of the graph is the green line with the triangles, which gives a 10-tank running average of mileage. The tank was filled on a roughly weekly basis, so each point reveals the mileage over the previous 2 – 3 months. This line always peaks in late summer to early fall, and its recurring minimums occur each winter. I get around 8% to 10% difference between the high and low peaks. 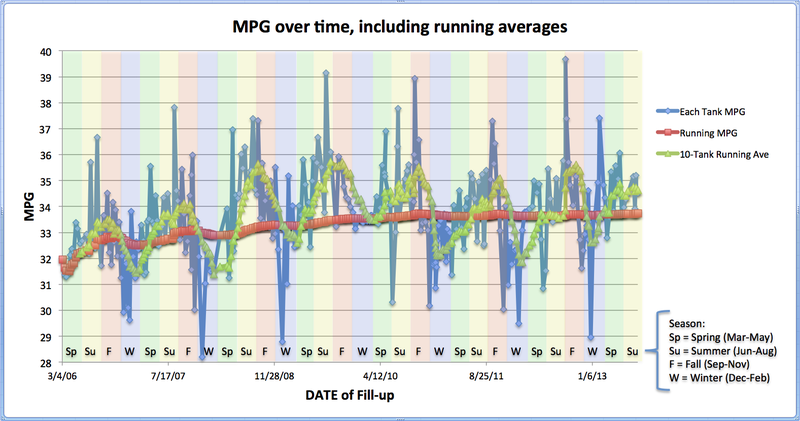 Why does the overall mileage (orange line) slowly but consistently improve from about 32 mpg to 33.7? Does the car ‘break-in’ or get otherwise happier over time? The worst of single tank mileages (blue points) almost all occur toward the winter, with an occasional bad one in the spring/summer. The top half-dozen tankfuls all occur in summer, but there was one good one (>37 mpg) in January of 2013. 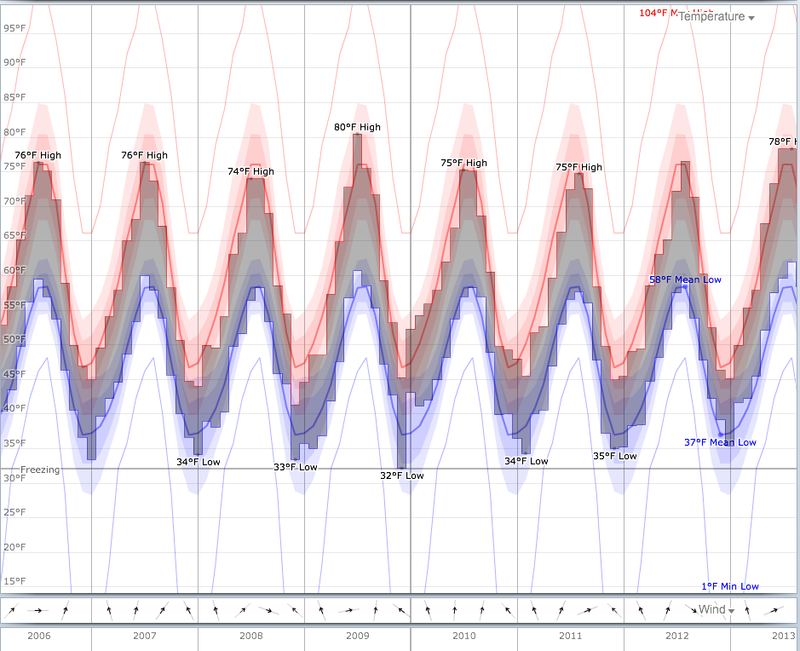 What causes the seasonal cycle — higher mileage in summer, lower in winter? For that last point, on the seasonal variation: One cause of course might be temperature change having a direct impact. Obviously that follows the same pattern of high-in-summer, low-in-winter. There’s lots of data available for the curious on various historical weather effects, for example from this Weatherspark site. * The graph below is temperature data for my area over the same time period, 2006-2013. Temperature data for Seattle (Boeing Field) for 2006 – 2013. Changes in driving style, which can be an indirect effect of the winter climate and planet orbit. More darkness and wet roads leads to slower speeds and more congestion, which reduce mileage. My commutes are frequently longer in winter for those reasons. Let’s use this data as an opportunity to explore how to bias or distort data to communicate a point you want to make. One good trick is the careful use of Y-axis manipulation, i.e. scaling the vertical axis to suit your purposes. Among the 298 fill-ups, I broke out the top 8 station brands** that I used (for 279 of the purchases), and then shifted the data so the mileage from each station could be compiled correctly (using the excel pivot table function). 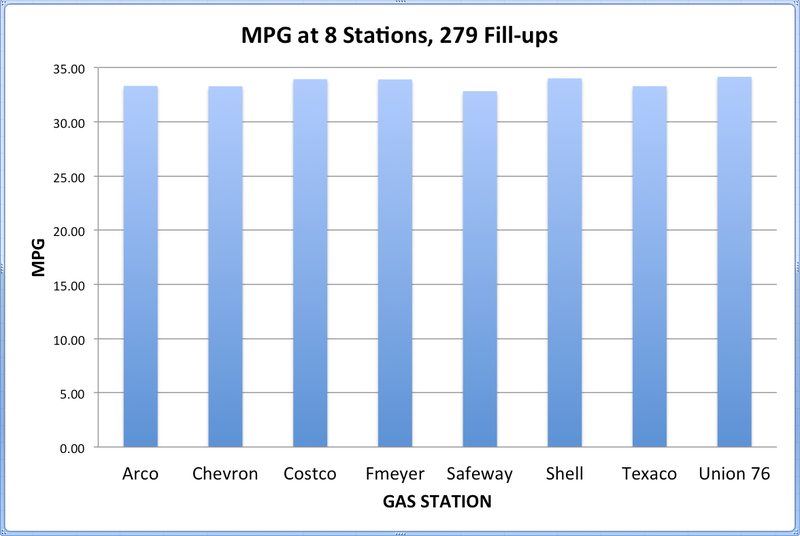 This first chart shows the average mileage from each of the 8 stations. Note that the vertical axis starts at 0. The normal passerby would probably say that all of the stations give about the same mileage — it doesn’t really appear to matter much where you buy your gas. Mileage data by gas station brand. All the same, right? But if you want to bias the audience toward or away from some station(s), how about changing the vertical axis (without changing any of the data). This time (next graph) just show the mileage numbers starting at 32.80 mpg. This is the exact same data as the previous chart, but now a quick glance from that average passerby will get a different reaction. 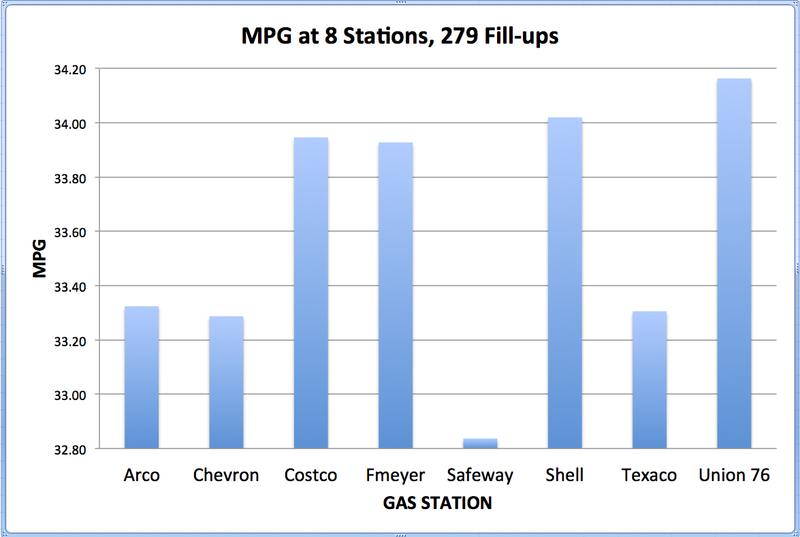 It looks clear that Safeway gas is for losers, while Union 76 is the champion — why, maybe it’s 20% better than the others! But in fact, the Union 76 mileage in my data is less than a half-percent better than Shell, and only 4% better than Safeway. But zoom in far enough on small differences, and they can look big. Zoom in on average mileage per station, with vertical axis starting at 32.8 mpg. Another thing not revealed in these plots is how many purchases were made from each place. A small data set for something like mileage tends to vary more than a large collection, which would be more settled toward its average value (if there is one). The next chart changes the vertical axis again, to start at 32.0 this time, and also adds some color and thickness effects to try to show frequency of visits. But on the very likely chance that this doesn’t work, the labels on the bars makes it kind of obvious. Yet another vertical axis starting point. With ‘depth’ and color added to the columns in a lame attempt to indicate frequency of purchases. 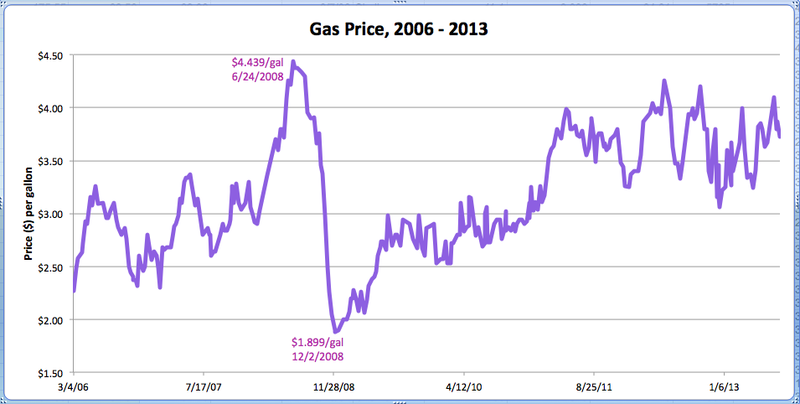 Finally let’s see how gas prices have varied during the last 7 years. This next graph might lead one to the following creative conclusion: gas prices above $4.40 are a strong indicator of imminent economic collapse. Maybe there’s something to that. If you’re so inclined, you can look up gas prices at your location (US and Canada) during this century HERE. ** FMeyer is Fred Meyer, a local-ish department store sometimes including gas stations. 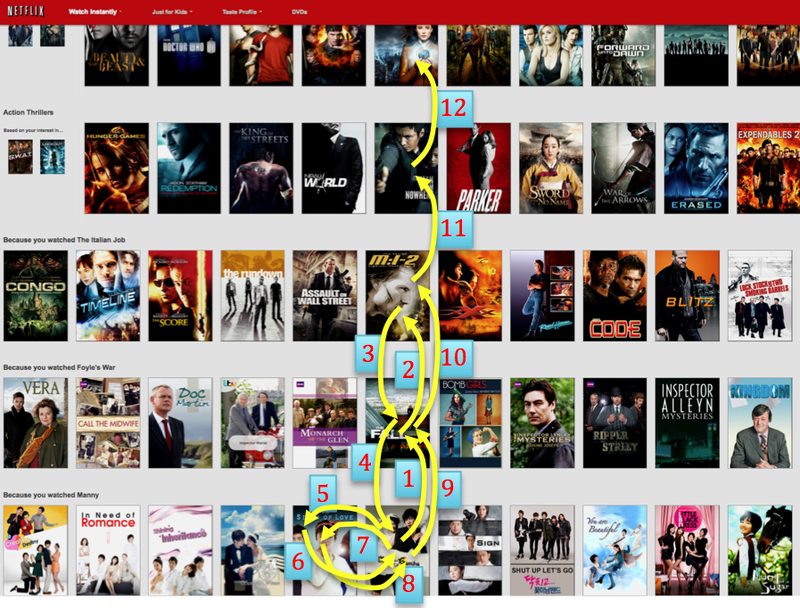 While I work in technology fields and am surrounded by and use devices all day long, I was recently stumped by a seemingly simple problem: how to change users in Netflix? A relative had come over and changed our login to his account, and I wanted to change it back. We get Netflix to our TV through a PS3 system and its wireless connection to the internet. This turned out to be a surprisingly hard problem. I may be slow, but I couldn’t find anywhere on the Netflix user interface for logging out. Minor usage note: On a PS3, this is more reliable if you use the ‘arrow’ keys rather than the joystick — the joystick can work but doesn’t always, perhaps because it senses some slight ‘angles’ which the interface uses as a straight scroll, but the pattern-recognizer rejects those to protect the super secret logout access. Go ahead and invest / waste 36 seconds of your life on the video, and another minute going off and discovering that it actually works. Here’s how it looks for those who like numbered instructions. For some reason. The secret pattern revealed. After this, the account page magically appears. Really.